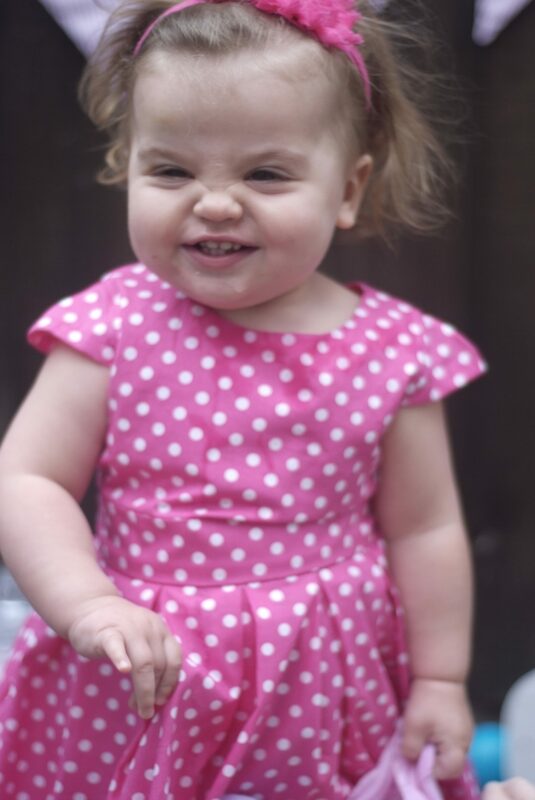 I was recently contacted by the lovely Emily from The Vintage Sweetheart and asked if I would like to pick one of her dresses for Charley to model and review. I am a huge fan of vintage clothing and love classic styles on children so I was straight onto the website to check out the choices. 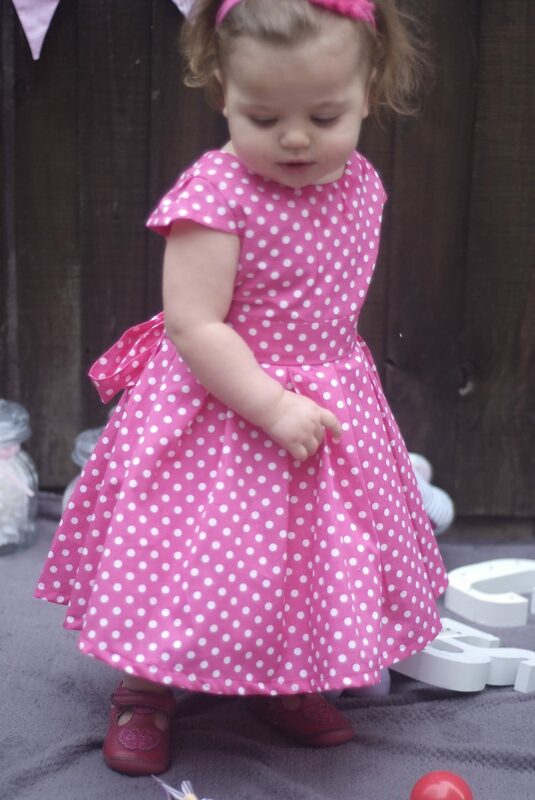 I am all for the latest CBeebies character on a t-shirt but when it comes to a special occasion I like my children dressed to impress.The design I choose for Charley was the Victoria Bossa Nova and to me the most classic vintage dress you can have is a pink polka dot one. She may only be 17 months but Charley was squealing with excitement when she put the dress on and as you can see from the photo’s she was very comfortable in it. I ordered a size 18mth- 2yrs knowing it would be a little big as Emily cuts her dresses larger so you can get plenty of wear out of them. 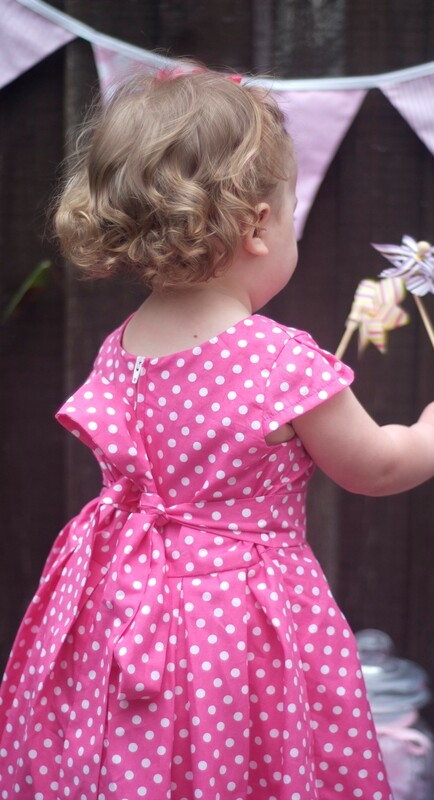 The style also has a small petticoat built in so it gives the skirt a little flair and a belt to make a huge bow with (If you can get your child to stand still long enough to tie it ). I really liked this dress on Charley and she loved wearing it. We were taking photo’s for nearly an hour and she was more than happy to stand and model in it. The tears only started when I tried to take it off her !! To give you a little brand background The Vintage Sweetheart was set up by fellow mum Emily who saw a hole in the market for ethically made, individually crafted children’s clothing. The designs are big and bold and the fabric is high-quality cotton. I can vouch for them being machine washable too as after the photo shoot Charley sat in mud and a quick 30 degrees wash was all that was needed to remove the stain and be as good as new.Emily is also passionate about giving back to so £3 from every dress sale goes to the Mango Tree Children’s Charity to help disadvantaged children in India attend school.Dresses are available from 0-3 months right up to 13-14 years and would suit any special occasion.Emily has a 10% discount code to use on your 1st order so if you think your little one would love a pretty new dress with a diffrence then just add HELLOTEN at the checkout. "Posts From The Heart #7"
"Todays Moment In Time #3"